Riley Morrison wrote Steph Curry requesting his shoes to be listed on the girls' section of the Under Armour site and Curry went above and beyond. 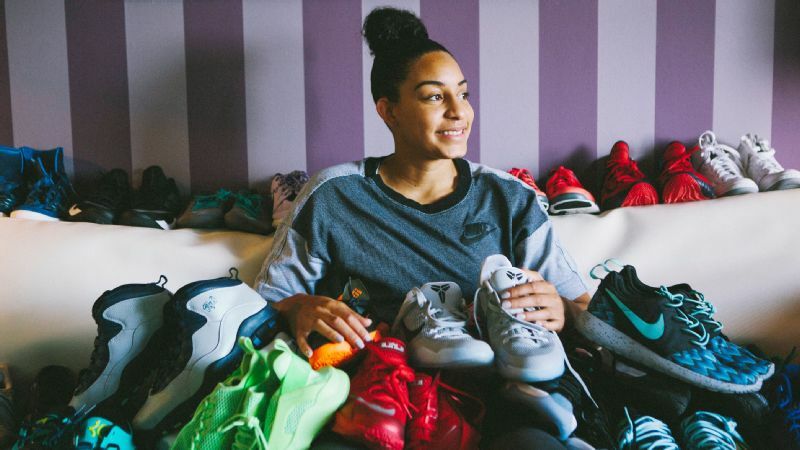 OAKLAND, Calif. -- For 9-year-old Riley Morrison, Thursday was already going to be the pinnacle of her improbable moment as an influencer in the basketball shoe industry. Riley was to be the headliner for the debut of Steph Curry's Curry 6 basketball shoe in girl's sizes, a development that came about in large part because of her fan letter to the NBA All-Star namesake of the Under Armour shoe line. She came to Curry's downtown Oakland pop-up store expecting to do a few interviews and even show off a sockliner that she designed. But while Riley was waiting around in the back of the store with her parents and older sister, a certain 6-foot-3 superstar, her basketball idol, surprised her by poking his head into the room. "It was extremely surprising," Riley said, still awed even hours later after meeting Curry. "He's a good person and extremely nice." Curry's cameo was a fitting bookend to the release of the shoes, believed to be the first time a marquee male athlete has been the face of a basketball shoe made specifically for women and girls. "Riley has boldly set an inspiring example for not only my daughters but girls all around the world," Curry said in a statement to espnW. "You're never too small or too young for your voice to be heard." 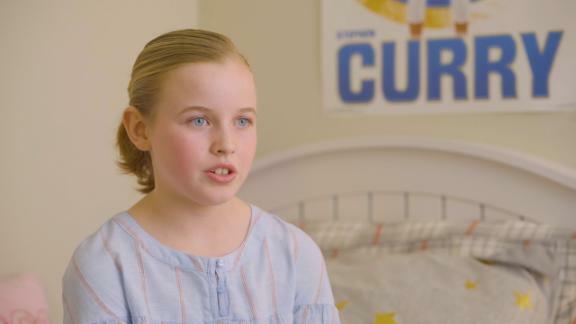 In November, Riley Morrison wrote Steph Curry a letter asking if his Under Armour signature sneaker collection could be sized for girls and women. On Friday, for International Women's Day, Riley's wish comes true. 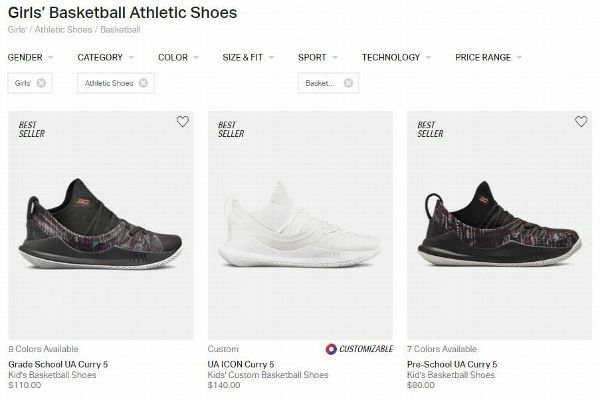 In November, Riley went on Under Armour's website hoping to order a pair of the Curry 5s when she discovered the shoes didn't come in girl's sizes. Her father Chris Morrison later found out the sneakers could only be ordered in the boy's section. "I said it wasn't fair," Riley noted. Chris, a Golden State Warriors season ticket holder, suggested she raise the issue with Curry in a handwritten letter sent to the team's fan mail address. "I figured we'd get a canned response," Chris said. "I had never paid that much attention to it before. But she kept bugging me." The response from Curry, which he posted on Twitter on Nov. 29, quickly went viral: "We are correcting this now! I want to make sure you can wear my kicks proudly." Then he invited her down to Oakland for the Warriors' game against Denver on Friday to celebrate International Women's Day. 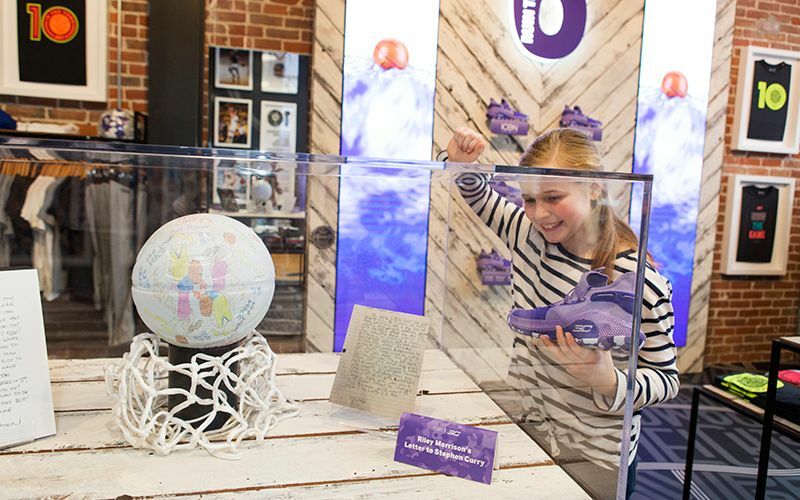 But first Riley and her family were asked to come down for the launch of the Curry 6 "United We Win" colorway -- "a blend of purple and deep orchid with white," according to Under Armour -- and a special sockliner the retailer asked her to design for the shoe. Riley responded by sketching out a design that features two girls playing basketball surrounded by phrases like "Rock The Currys," "Girls Hoop Too," and "Play With Heart." 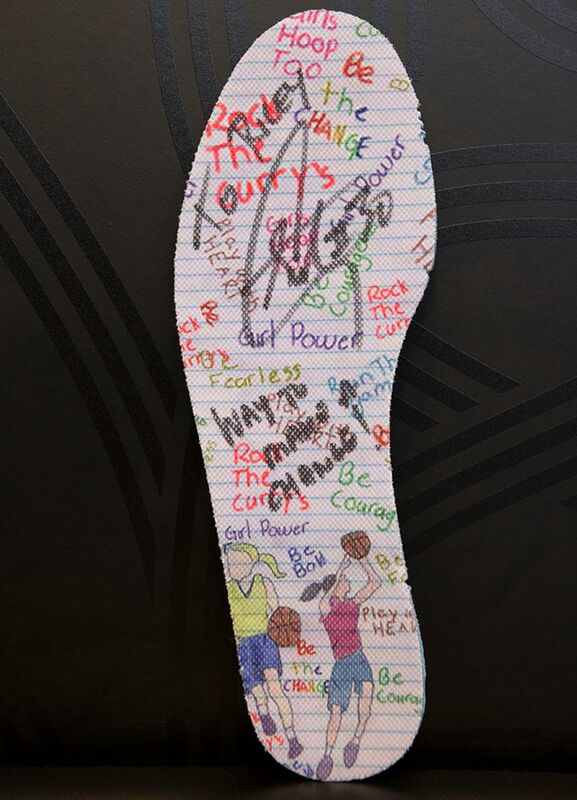 This is the sock liner Riley designed and had signed by Steph Curry at the Under Armour pop-up store in Oakland. It was the culmination of a possibly unprecedented moment in the history of basketball shoes, said Matt Powell, a sports industry advisor for the NPD Group. 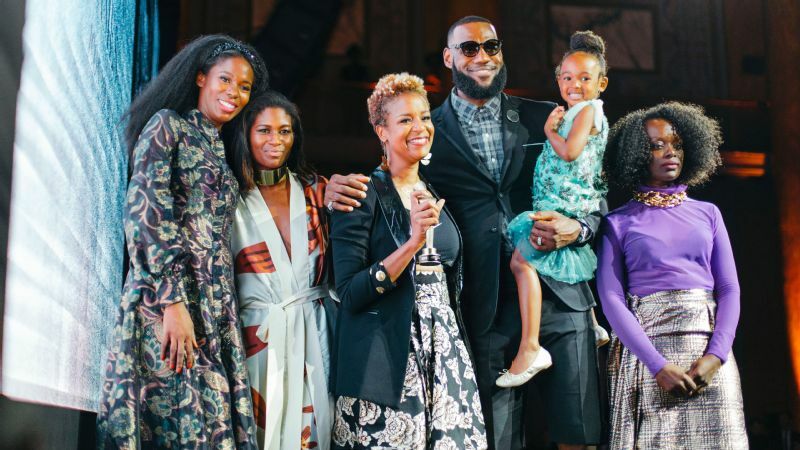 Powell pointed out that before Curry, only women -- former WNBA stars like Sheryl Swoopes, Dawn Staley, Cynthia Cooper and Lisa Leslie -- had ever marketed their own line of basketball shoes specifically to women and girls. "I think the industry has gotten away with selling women men's shoes over the years and it's certainly more efficient and less expensive to do it that way," Powell said. "But I'm certainly glad to see Under Armour responding quickly to this and trying to offer products that are appropriate. "Women's footwear remains our greatest failure and our greatest opportunity." On Thursday afternoon, about 20 people gathered outside the downtown storefront to gawk at Curry inside the shop, taking pictures of him on their phones. Curry and Under Armour opened the pop-up shop in December, selling Under Armour apparel and special T-shirts and caps and other items that can only be found there from noon to 7 p.m. on Fridays through Sundays and on the nights of home games. Riley peeking into the display case of the letter she originally wrote to Steph Curry at the Under Armour Store in Oakland. The small crowd and TV cameras were certainly a new experience for Riley, a fourth-grader at Napa Valley Language Academy, about an hour north of downtown Oakland. She wore her new Curry 6s around the store while being shepherded from one media interview to another, her parents and 11-year-old sister cheerfully trailing along behind her. Riley has gradually grown into her newfound celebrity, her parents said. She has even signed a few autographs at school -- and a classmate's forehead. "I'm just so proud of her and how she's handled it," said her mother, Megan Lopez, a former softball player at Chico State and now one of Riley's youth softball coaches. "And she's definitely got a new poise and controlled confidence to her now." Another benefit of the surprise meeting with Curry on Thursday was the chance to pick up a basketball tip or two that Riley plans to incorporate into her game. Riley said she already modeled herself after -- surprise! -- Curry as the point guard on her Catholic youth league team in Napa. "I try to play like Steph," she said. "Whether that's being a good ball handler or trying to make good choices." And now she'll have the shoes to match.